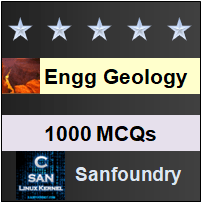 This set of Engineering Geology Multiple Choice Questions & Answers (MCQs) focuses on “Fault Terminology – 03”. Explanation: Heave is the horizontal component of dip separation measured in a direction perpendicular to the strike of the fault in a vertical plane. 2. What signifies actual separation between two beds? Explanation: Stratigraphic throw signifies actual separation between two beds with known stratigraphical position in a sequence of rocks that are now brought into contact by faulting. 3. What is the term related to slickensides and used to express angular relationship? Explanation: Rake is a term related to slickensides in faults. It is used to express the angular relationship of slickensides or some other line with the fault plane. 4. Pick the term which is not a crushed material. 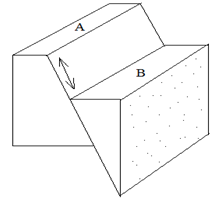 Explanation: Rubbing and mutual shearing of blocks during faulting, especially in brittle rocks, often produces typical crushed materials from the involved blocks that are useful indicators of faulting in that region. The most common and important products are: Gouge, Fault breccia and Mylonite. 5. What is also called as Micro breccia? Explanation: Mylonite is also called as micro-breccia and is similar to fault breccia but contains very fine-grained broken particles from the involved rocks that get thoroughly cemented and compacted. Explanation: Gouge is finely pulverized, clay-like powdered rock material, which occurs at or near the base of the faulted zones. 7. The evidence of slickensides is easily observed in old faults. State true or false. Explanation: The evidence of slickensides may be expected only on the recently faulted surfaces because in the old faults such an evidence is more likely to be removed by subsequent weathering. 8. Identify the type of slip from the figure below. Explanation: The displacement has essentially taken place along the dip of the fault. Hence the figure represents dip slip. 9. Identify the part labelled as “A” in the figure below. 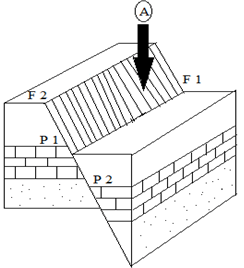 Explanation: The part “A” is clearly bearing the evidence of frictional rubbing against each other suffered by them during the process of displacement due to faulting. Hence it is showing slickensides. 10. Gouge and fault breccia are both in finely powdered form. State true or false. Explanation: Gouge is the finely powdered form but faulted breccia is not. Faulted breccia is crushed angular, fragmentary material produced during faulting, especially when the rocks are brittle and hard. 11. Identify the region marked as “OP2”.